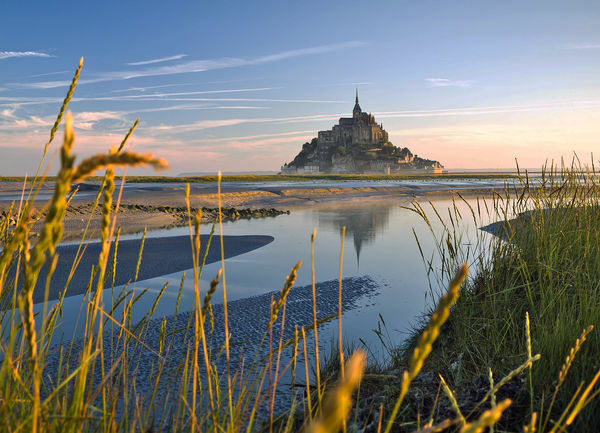 This island abbey of Mont St-Michel, one of the top pilgrimage sites of Christendom through the ages, floats like a mirage on the horizon, just off the Norman coast of France. For more than a thousand years, its distant silhouette has sent pilgrims' spirits soaring…and it does the same for tourists today. For centuries, devout Christians endeavored to make a great pilgrimage once in their lifetimes. If they couldn't afford Rome, Jerusalem, or Santiago de Compostela, they came here, earning the same religious merits. 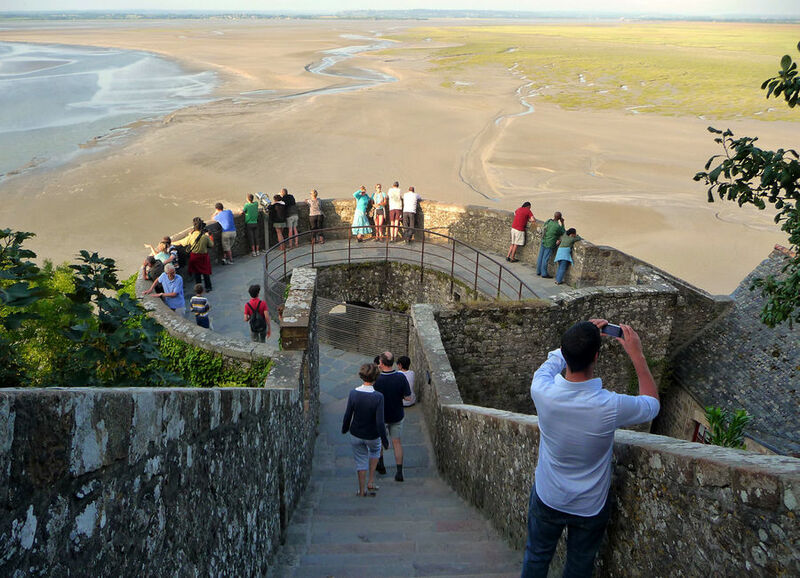 The vast Bay of Mont St-Michel, which turns into a mudflat at low tide, has long played a key role here. Since the sixth century, hermit monks came here in search of solitude. The word "hermit" comes from an ancient Greek word meaning "person of the desert." The closest thing to a desert in this part of Europe was the sea. Imagine the "desert" this bay provided as the first monk climbed that rock to get nearer to God. This rock — a small mountain forming an island — was even more isolated by they bay's dangerous quicksand, disorienting fog, and mythic tides. Pilgrims crossed the mudflat to the island quickly and carefully, knowing that the sea swept in "at the speed of a galloping horse." In the late 1800s a causeway was built, connecting the island to the mainland and letting pilgrims come and go without hip boots. The result: Much of the bay silted up, and Mont St-Michel started gradually becoming part of the mainland. But in 2005 an ambitious 10-year project was launched to keep it an island — and today a super-sleek, artistically swooping bridge allows water to flow freely around Mont St-Michel, preserving its island character. The shallow bay it sits in stretches from Normandy to Brittany, fed by the Couesnon River — which marks the historic border between the two lands. Brittany and Normandy have long vied for Mont St-Michel, and the river used to pass on the other side of the abbey, making it part of Brittany. Today Mont St-Michel is just barely — but thoroughly — part of Normandy. The town of Mont St-Michel — with fewer than 50 residents — now entertains more than 2.5 million tourists a year (and a steady trickle of pilgrims). If this place seems built for tourism, in a sense it was. It's accommodated, fed, watered, and sold trinkets to generations of travelers who visit its towering abbey. Its main street — lined with shops and hotels leading up to the abbey — is always flooded with visitors, and grotesquely commercial. It's some consolation to remember that, even back in the Middle Ages, this was a retail gauntlet, with stalls selling souvenir medallions, candles, and fast food. Omelets were popular for eat-and-run pilgrims who needed to beat the tide — and they're still an island specialty and popular with tourists. Early risers win with the best light — and the fewest other tourists. 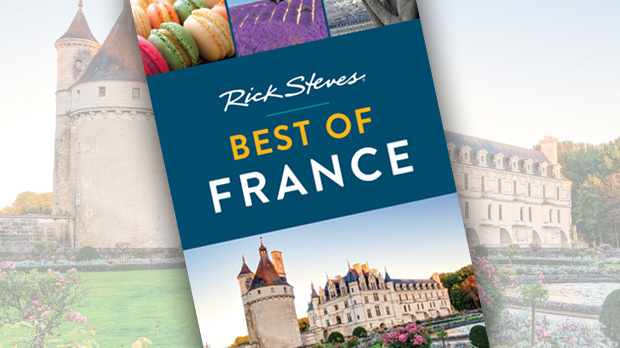 As the town fills up, you can skirt the main-street crowds and enjoy Mont St-Michel's fine 15th-century fortifications by following the ramparts up to the abbey. They were built to defend against a new weapon — the cannon. Rather than tall, they were low — to make a smaller target. While the English took all the rest of Normandy, they never took this well-fortified island. Because of its stubborn success against the English through all those years, Mont St-Michel became a symbol of French national identity. For centuries pilgrims and monks have climbed the abbey's stone steps. The abbey of Mont St-Michel has been a holy site since the year 708, when a local bishop had a vision in which the Archangel Michael convinced him to build here. This was an immense building project evolving over many centuries. It was a marvel — a medieval skyscraper, built upon a rock crowned by a gilded statue of Saint Michael. When you visit, imagine the headaches and hassles of the monks who ferried granite from across the bay and hiked it uphill. A walk in the abbey is a one-way route through fine — but barren — Gothic rooms. 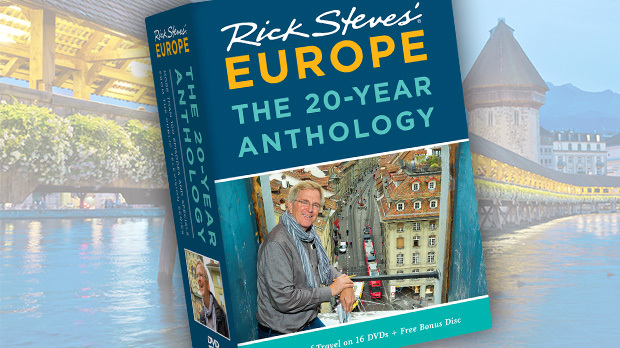 A rented audioguide or English-language tour make this historic sight more meaningful. A highlight is the giant tread-wheel, which six workers once powered hamster-style to haul two-ton loads of stones and supplies from the landing below. This was used until the 19th century. The monks built as close to heaven as possible, on the tip of the island rock. The downside: There just wasn't enough level ground to support such a big abbey and church. The solution: Immense crypts were built under the church to create a platform supporting each of its wings. Sitting atop all this heavy construction like a delicate flower is the abbey's cloister. This peaceful zone connected various rooms. Here monks would grow vegetables and medicinal herbs. They'd meditate and read the Bible. The more secluded a monk could be, the closer he was to God. And, for thoughtful travelers today, this abbey still inspires.